Vision is often thought of in terms of what is "seen" or what is not seen, but this is an oversimplification of a multiple faceted neurological function that touches to some extent, almost all of our impressions of our world. 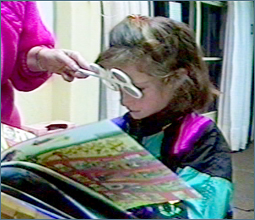 Testing of distance vision with a chart across the room is not an adequate way to anticipate the difficulties that a child may encounter in learning to read, a task for which focusing at near (accommodative system) and saccades are required. In order to function in the present day world the eyes must move rapidly, in many different directions, and they must accommodate to near and far focus with efficiency. This course discusses the important aspects of functional vision efficiency and how they relate to assessment and intervention. 1. List the basic visual skills that comprise functional vision. 2. List the four categories of functional vision efficiency. 3. List the major transitional skills needed to progress from one level of efficiency to another. 4. Describe the influence of prism lenses. Occupational, Physical and Speech Therapists, Vision Therapists, and other Rehabilitation Specialists. For special needs requests please contact us by phone or email. contactus@clinicians-view.com Phone 575-526-0012. Fax 575-526-0014.